This is Party Tibetan. After buying some eggs for our breakfast he pulled up and invited us to dinner with excellent english. After having excellent meal(this is Sichuan after all). We went for tea and he invited us to stay in his this evening and we accepted . A little bit later he started saying he would put us up in a hotel. NOt wanting to put him out of pocket we said no but he insisted. We accepted and then later he told us that we were staying in a hotel instead of his house because he had just been invited to a party. We laughed and said we’d see him tomorrow and left him to go to his party. The next mornign Party Tibetan arrived half an hour late stinking of drink and looking failry hungover. We walked around the local monestary third biggest on the plataue. We bumped into this chinese cycle coming the opposite way to us. 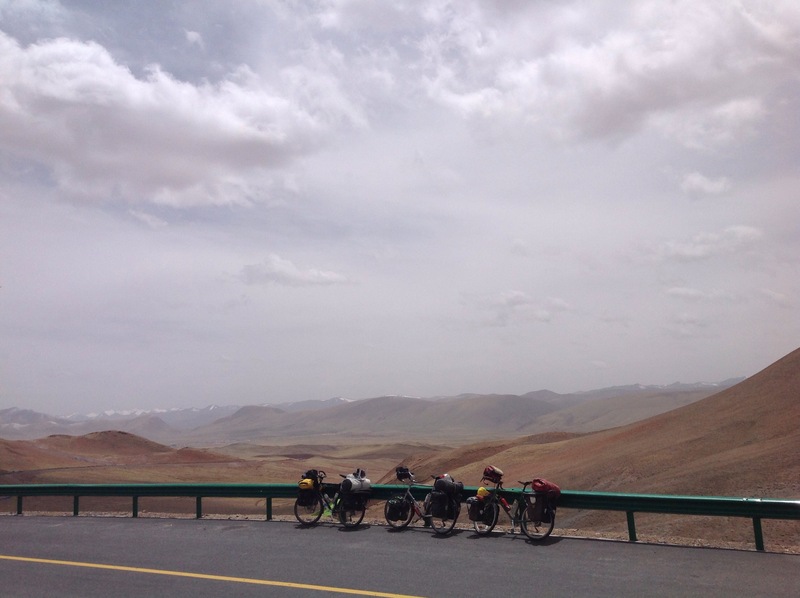 With our broken chinese and his broken english we figured out he was spending three years cycling around just china(you’d need it). And yes he is cycleing with a guitar on his back. Less than 1000km left as a trio. These guys were all smiles until the camera came out. Family Who say us from the road came over to have a better look. This actually happens all the time especially here. Many people wave you over for tea and unfortunaly you can’t stop at all of them or you wouldn’t get anywhere. This monk was just short of jump up and down so i just could refuse. He was with a group camping in the mountains picking the catapiller fungus. He gave us tea yogurt with sugar and a soft drink for the road. Andre getting of his bike to get the best shot. Getting closer to the top of a climb we can be heard chanting tunnel to each other, hoping to will one into existence. Unfortunatly this door was lokked, would have been fun to see the inside. At the higher altitudes, vehicles have reduced horspower because of the thinner air. So the roads can’t be too steep. This results in beatiful switchbacks winding their way over the pass. Someone gave this to me on a climb turned out to be soda water. NOt quite as useful as the red bull they gave hugo. 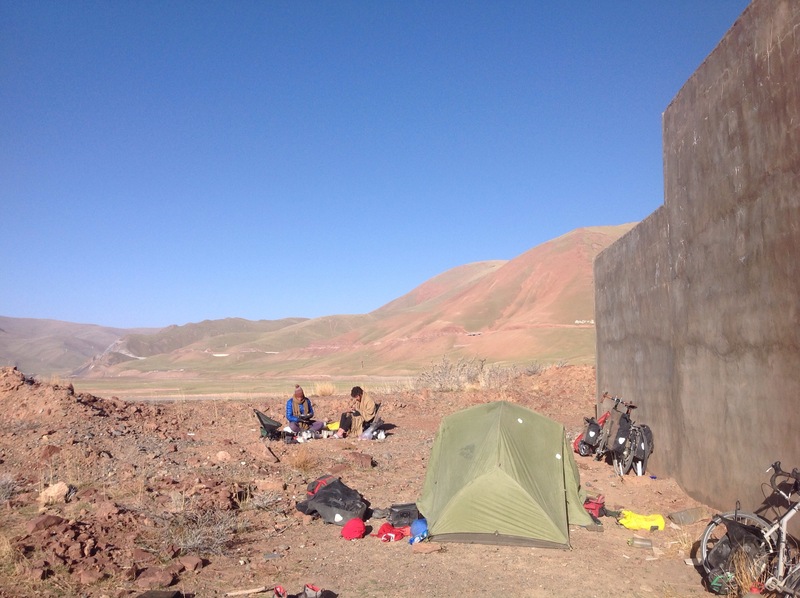 We got invited for dinner by a some tibetans building a house near our camp spot. Tibetan food may not be the most exciting but the company is second to none. The panda cubs were hilariously. Seeing these guys climb and wrestle explains why there are so few left in the wild. That top one is actually stuck in the Y. After hitting the other one in the face until he knocked him off he fell out and landed on his head. A red panda having lunch. Aww, last shot of us. 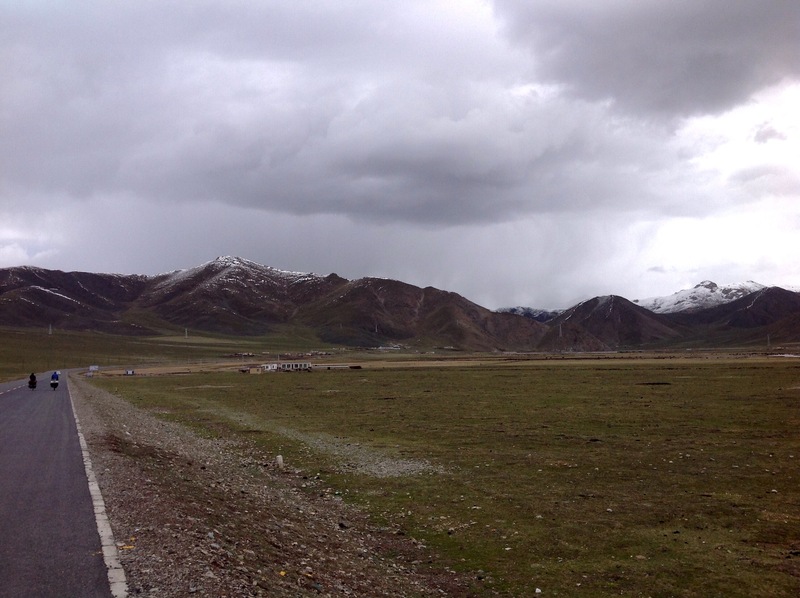 Everyone who saw us was asking if we were on our way to Lhasa. 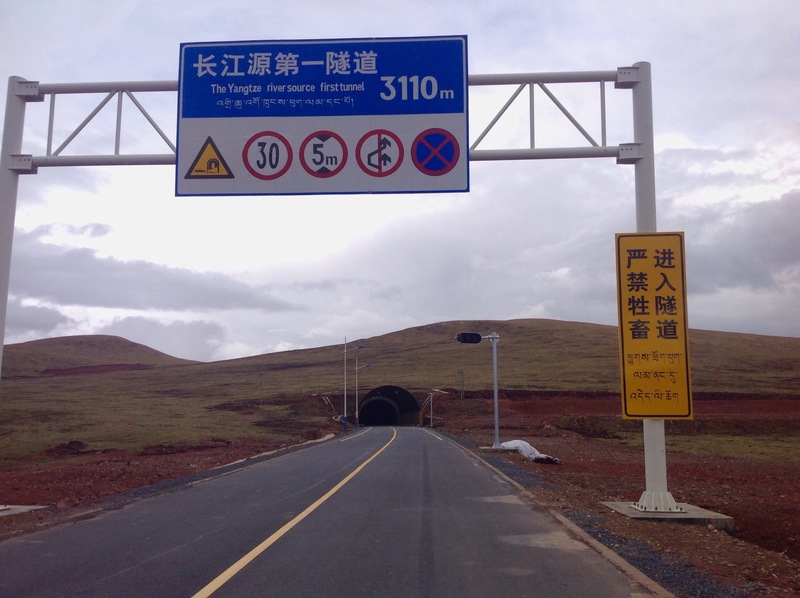 It’s a popular destination for Chinese overlanders. Unfortunately, we would not be joining them. Noodles in a filling station. After leaving here, a hilarious chinese guy on a motorbike hung out with us for the evening. 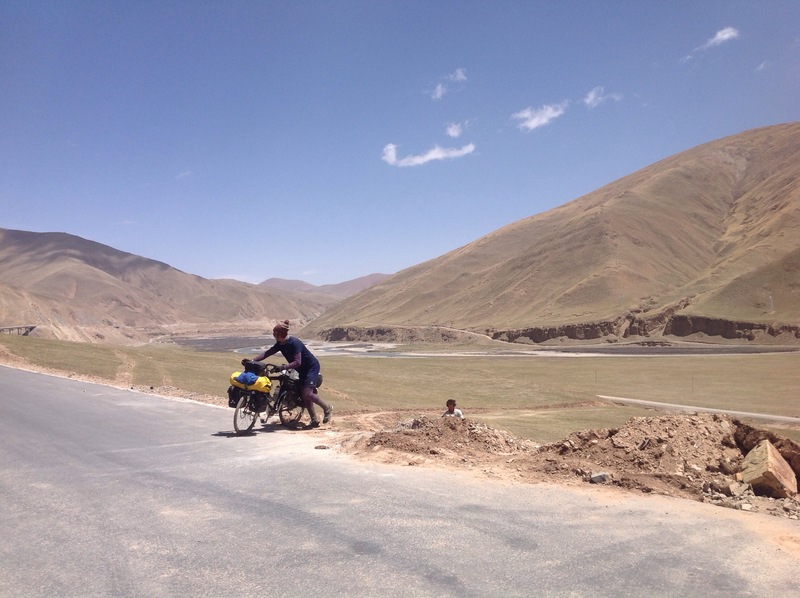 After finding out he was going to Lhasa we asked if he was going to see the Potala Palace. Through his translator app he replies ‘No, i travel to feel the feeling’. Right answer. “Maybe theres a restaurant around this corner” we finally found somewhere well after dark. We were literally jumping with joy. And we are officially on the plataue. Thats about the height of Mont Blanc for some refernce. And the plataue is as a flat as you’d expect. It snowed every night on the plateau. All this snow would be burned off by noon at at this altitutde. As a combination of the stronger sun a and lower melting point. After every climb there’s a descent, and on the plataue both are pretty big. Thanks for the coffee Vinnie. Huge vultures scared from a carcas . Combustion engines loose a lot of power due to the lower oxygen. So the roads have to be long winding switchbacks that never get too steep. make for pretty scenic riding. A lot of the roads we’ve cycled on have been so fresh that they’re still steaming. This was one of them. The wind was so strong we could barely stop. 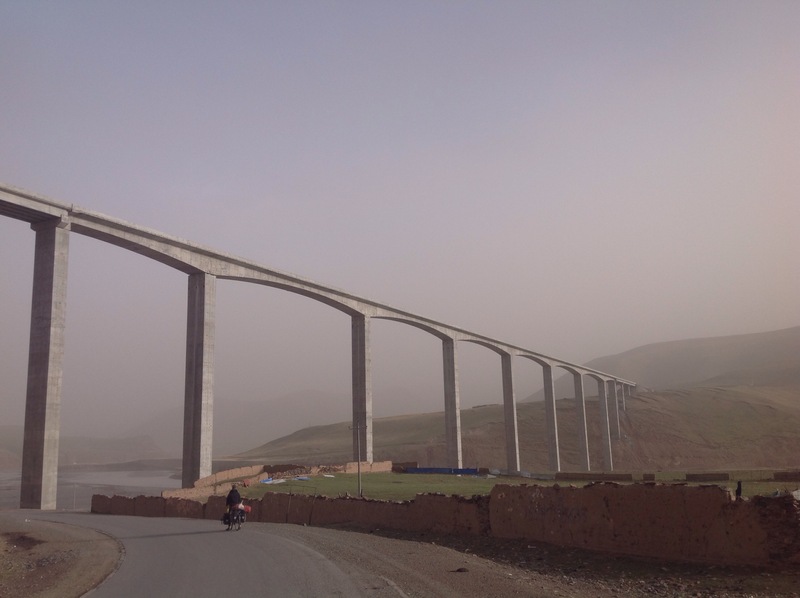 This Brand new bridge towering over rural china sums up the country pretty well. Evening riding is pretty nice. This is how we spend most of our days off. Weather at the passes is pretty volatile. A shaggy dog losing his winter coat. One of our better camp sites. Newly built temples are quite common as the Chinese realise their value to tourism. All you have to to to receive a nice new temple is renounce any relation to the 14th Dalai Lama. Monks practicing their dance moves. 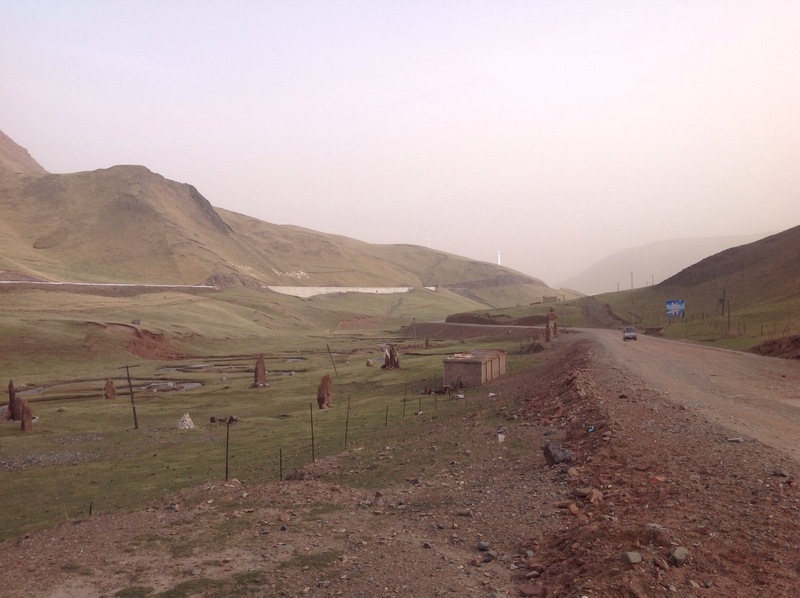 Entering The Princess Yushu Temple valley. Prayer Flags sending out good fortune to all sentient being. They are a pretty common sight all across the plateau. Monks taking pictures of each other. They were all to happy to pose for mine when the saw me. A wrathful Dharma protector. If you give away any sect secrets and he’ll be coming after you. The faithfull circumambulating the world’s largest Mani Wall. This monastery was destroyed. Our guide explains what happened, something involving guns. Couldn’t figure out whart or whom they were used on. A veiw into a prayer hall while monks chant. Chinese make pretty nice roads. We met a lot of families picking caterpillar fungus. They were even more surprised to see us on bikes up this pass then we were seeing them. After chatting with them they gave us a push up the hill to get us going. The weather cleared up when we reached the pass. The snow stopped and it remained overcast for the morning. 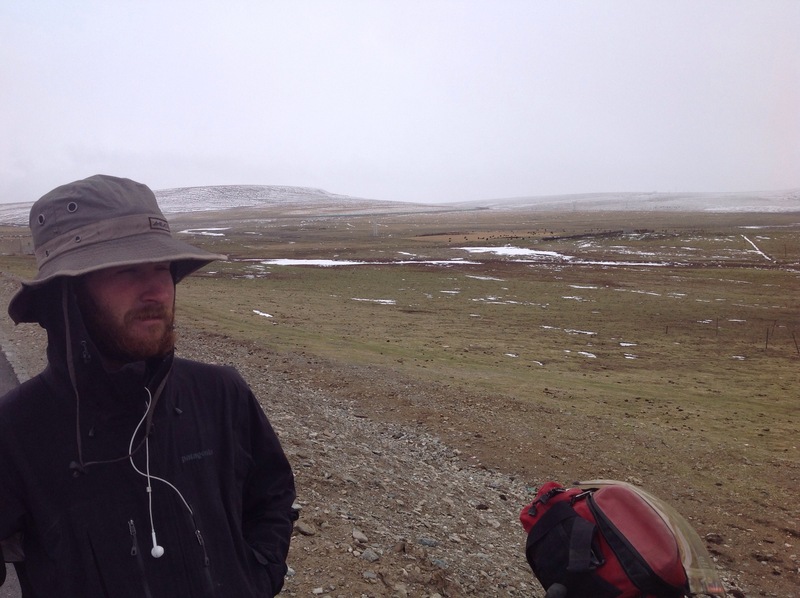 Finn woke up feeling the effects of the altitude, finding it difficult to focus his sight properly. The man in the shop opposite which we camped sold him a sheaf of tablets that seemed to cure the problem and so we got underway. We had camped before a pass so a decent chunk of the morning was spent getting over that. 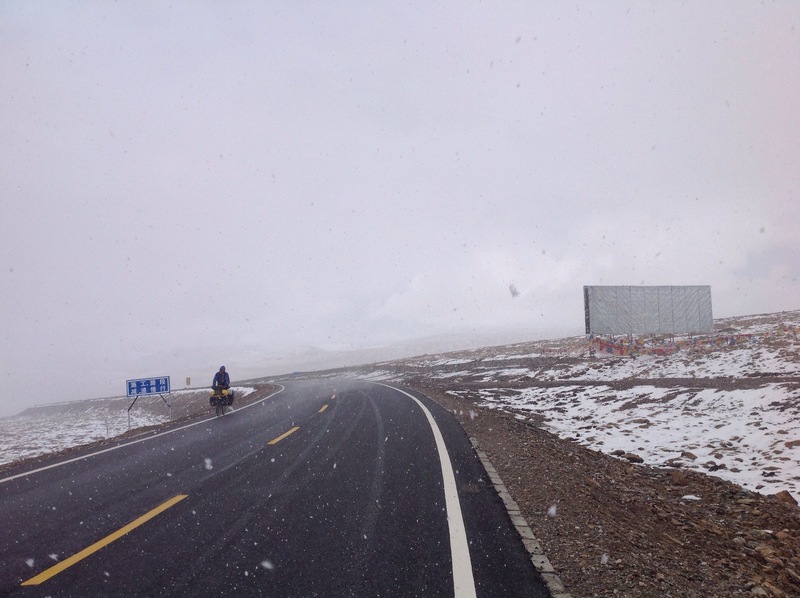 As we approached the top so,e bad weather blew in bringing with it snow and hail, reminding us that we were cycling now at 4800m at the top. On the descent we ran into another bike tourer coming the opposite direction. This was Alex, an American guy who had begun cycling from Bangkok. 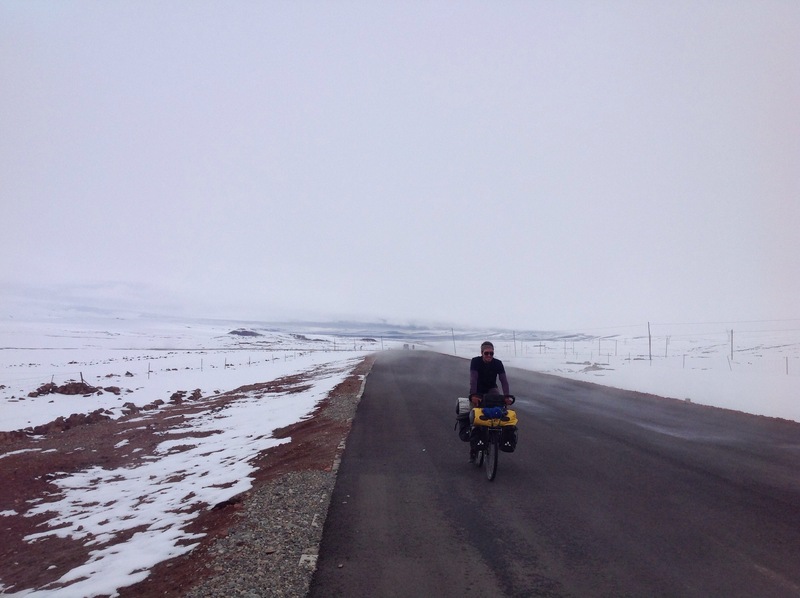 He was still new to bike touring had a bunch of questions for us. We spent over an hour talking beside the road, handing out tips about the road ahead. He informed us that there was a small town at the bottom of this descent where we could get lunch. It’d had been a long time since we’d met an English speaking bike tourer on the road (let alone a native English speaker at all) and Alex likewise so we indulged in conversation. 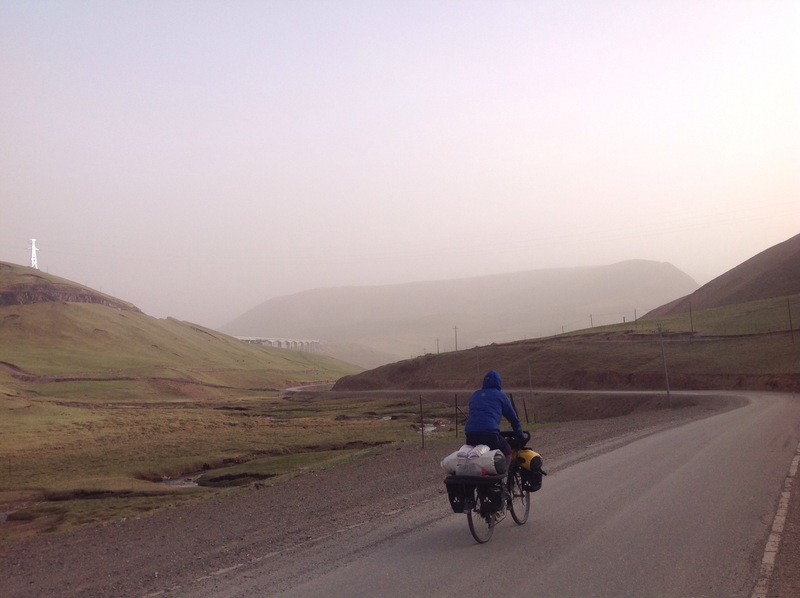 As we said our goodbye I felt a bit bad for Alex, he had been complaining of riding into a headwind for the last 600km and he would have to put up with it at least one more day as the wind was at our backs, pushing down the mountains. We came down from the brown rocky pass and back into the greenery of the grassland between the peaks. The road joined up with a river now and followed a wide curve up into a nook in the foothills where a town had sprung up. The main street was lined with one story open front shopfronts that mostly seemed to sell auto supplies or perform auto repair but at the edge of town we found a noodle place to get some food. 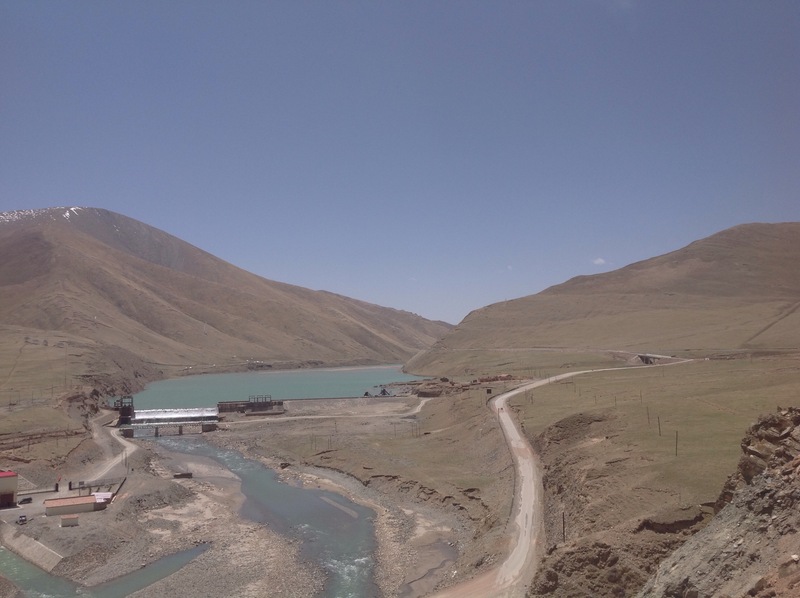 Alex had provided us with a valuable piece of information: that the last pass before Yushu that we had yet to climb could be avoided by taking the newly constructed tunnel. The tunnel wasn’t open to traffic yet but was finished and functional, he had come through the tunnel himself on the way up. 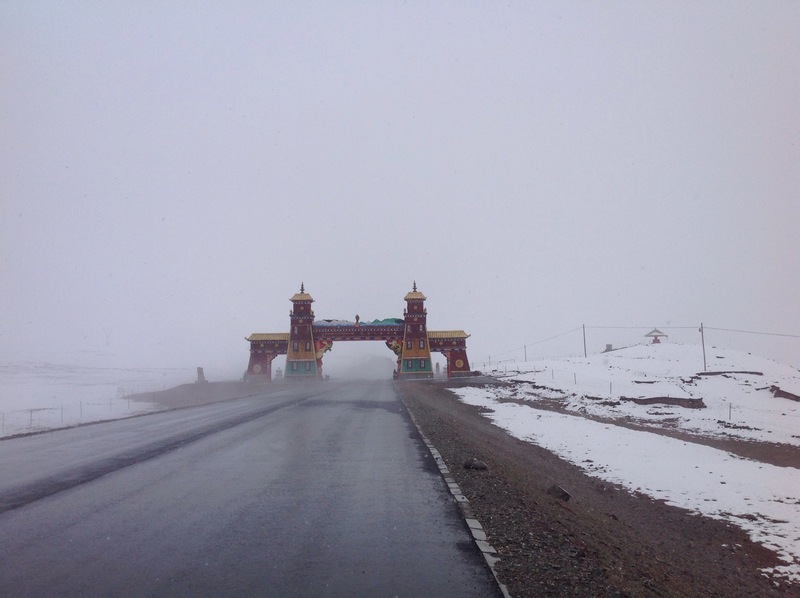 With this in mind we knew we could make it to Yushu tonight, even though it was still about 80km off and now lunchtime. The final 40km were all downhill, all we had to do was get to the tunnel. The lunchtime ride had us following the length of this picturesque valley under a now clear blue sky through the grassland. Small huts and monasteries sprang up along the road occasionally. As the road trended upwards we passed another little village of government-built identical houses. On the other side of this village we arrived at the tunnel. Riding through the tunnel saved as a load of time. 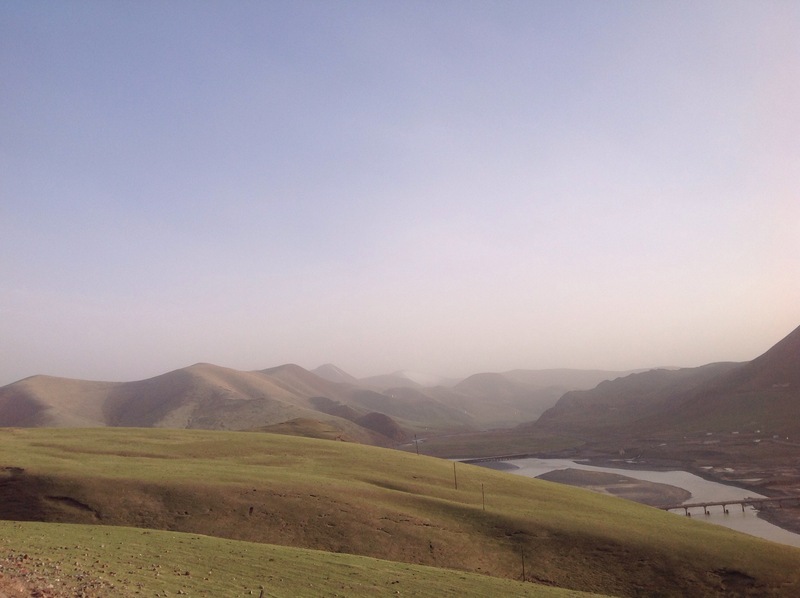 On the other side of the mountain the weather was not as clear, but the overcast sky added to the feeling of a complete scenery change as we descended rapidly front the open plateau into a narrow gorge between tall, tough looking grassy hills. We were once again reminded of Ireland, or probably more apt Scotland as I don’t think we have peaks near this high back home. Unfortunately I was enjoying the descent so much I forgot to stop and take photos. The weather cleared up the following day so we said goodbye to Tashi. His grandmother gave us a thangka, a thin white scarf given in Tibet as a good luck for travellers before we left. 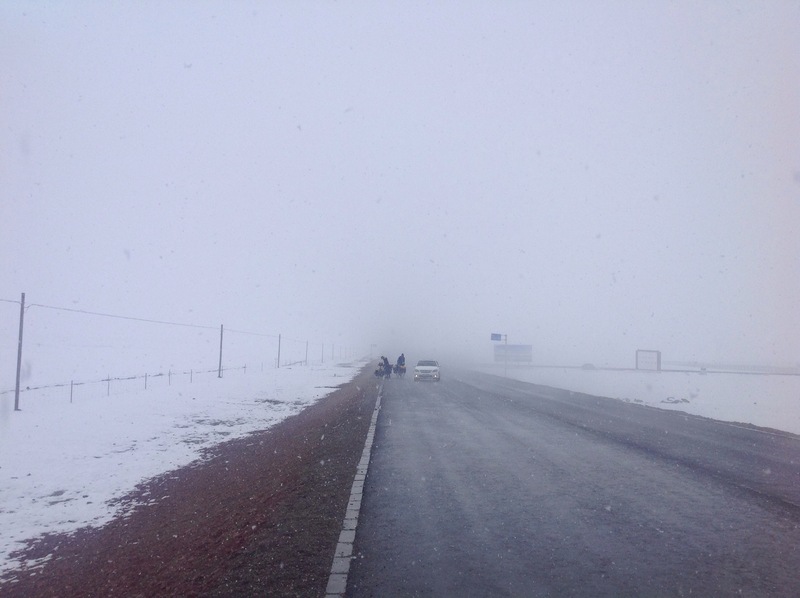 The weather closed in again as we made the climb out of the valley in which Zhidoi sat. It started to hail then snow. The limited visibility was a stark contrast to the wide open vistas we had had the luxury of riding through before. The weather cleared up by the time we reached the top though, it seems to be a law of nature that as soon as you bother to put on the extra gear for bad weather it clears up. It was a comparatively uneventful ride for the rest of the day. When we stopped for a break there was always at least one car that would stop and its passengers come over to take photos with us. We spent most of the day climbing so by evening the temperature dropped significantly. A cold wind blew in and the snow started up again. We pulled into a small shop on the outskirts of a tiny hamlet and decided there was no point in continuing on and making ourselves miserable. We set up our tents in a field opposite the shop and crawled out of the wind and snow. 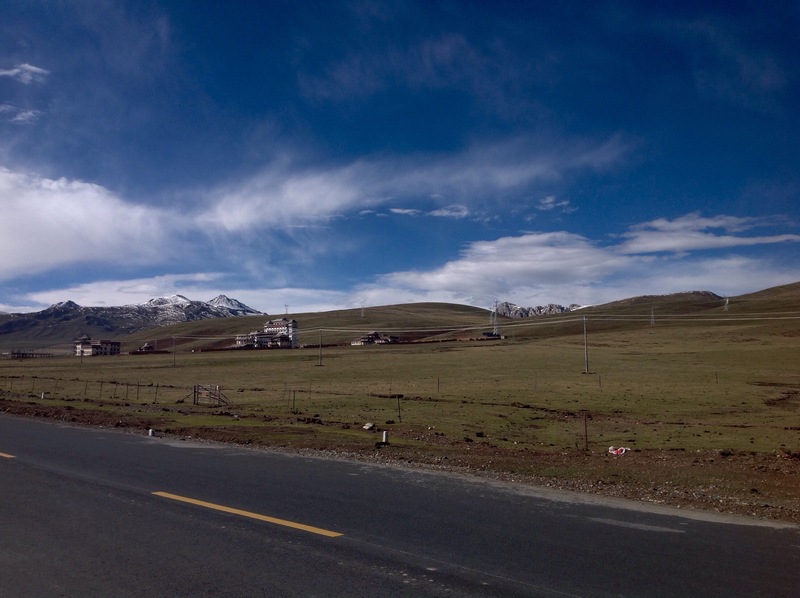 Tashi’s town of Zhidoi was very near a monastery, and a large once, that we were eager to see. Tashi taught some of the monks up there, including the young boy who was reincarnated Lama of this particular Buhdist sect and arranged for us all to go up there and have a look around. In return he wanted us to cook him his favourite western dish from his time abroad: mashed potatoes. Mashed potatoes made with yak butter is an unusual but tasty alternative, and Tashi seemed quite pleased with the meal. After lunch we borrowed his uncles car and drove out to the monastery. 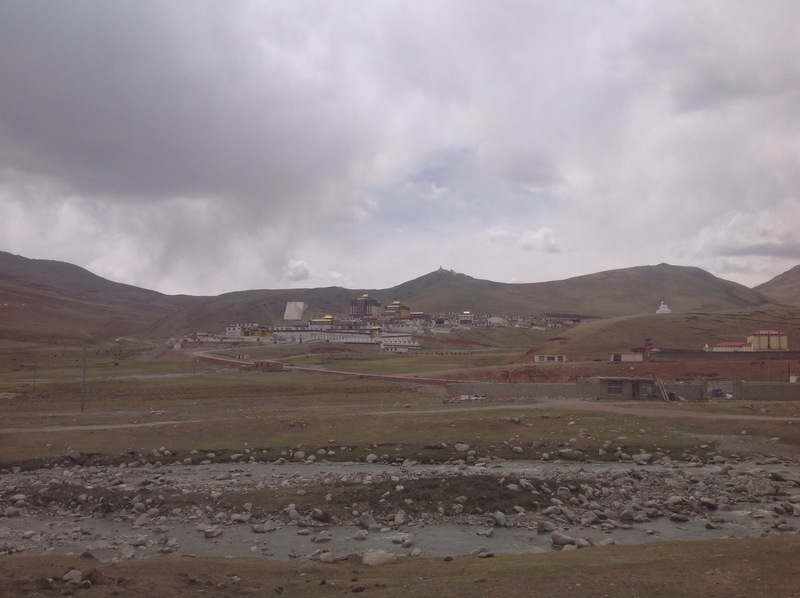 The Gongsa Monastery is huge, though not the biggest by a long shot. Tashis monk friend met us at the entrance and showed us around. Unfortunately we couldn’t get any photos inside the buildings. We saw first the prayer hall, lit by yak butter lamps the pungent smell of which you quickly learn to associate with Buddhist monasteries. Ere were a dozen or so monks in there chanting their sutras, and along one wall a shelf with that held all the monastery’s texts. We then went to see two large halls that held, first a large statue of the founder of the yellow hat sect of Tibetan Buddhism that held a Guinness World Record of some category. The second a large stupa, a shrine to one of the Lamas of the monastery. I’m not sure if the stupa held any record, but judging by its size I wouldn’t be surprised if it did. Finally we visited a third hall that was in the decoration phase of its construction, about five young guys had been brought in from Tibet proper to paint the detailed iconographic imagery on the walls. Afterwards our monk guide had to go off and teach, so we thanked him and said goodbye. 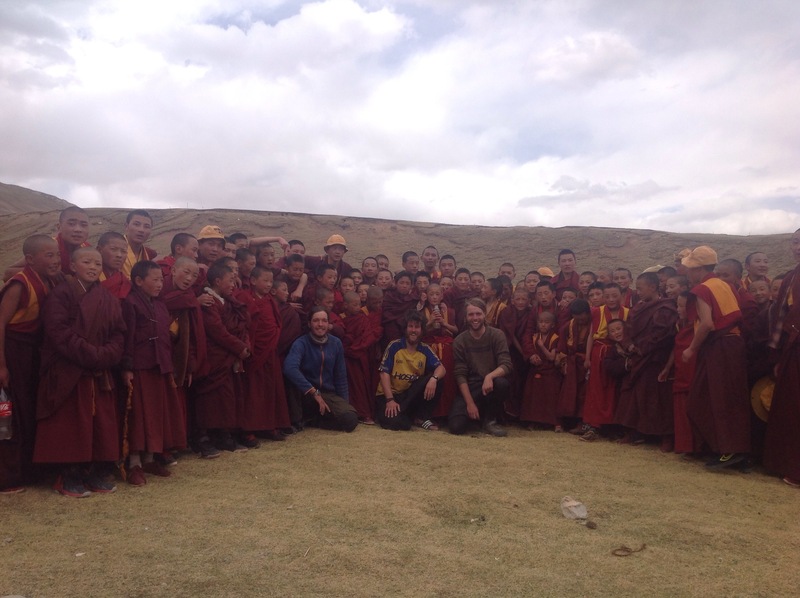 The young novices of the monastery were playing in field at the bottom of a hill and Tashi suggested we go over and say hello to them, most of them hadn’t seen a westerner before and were very excited to see us. We planned to leave Zhidoi the next day but a snowstorm blew in overnight and continued throughout the morning and then all day the next day, so we stayed an extra day taking shelter in Tashi’s place. We helped Tashi write application letters for scholarships to London Film School, where he had been accepted but couldn’t afford the tuition. Hopefully he gets the funding. We woke up to a sunny day. We had breakfast (scrambled eggs and bread. Eating oats every day can get stale) and then hit the road. The old road that is, the new road ran almost in parallel to the old except 80m above along the face of the hill, rather than next to the river itself. We passed through a small police checkpost, the police more interested in collecting photos with us than our details. Then then we proceeded along this green valley, picturesque and serene. After a while we got it into our heads that we may as well ride on the new road since it seemed, for all intents and purposes, complete. Just not fully open to the public yet. We kept our eyes open for some way to get up onto it. The first on road ran right through someone’s house, so that wasn’t really an option. A couple of kilometres down the road though the new road dipped a bit and a dirt track led up to it. 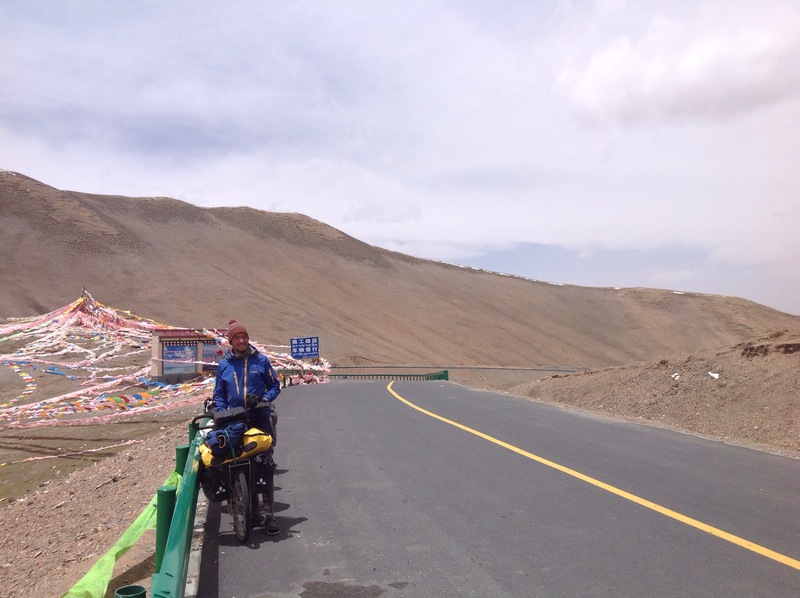 We hauled the bikes along the track up to the road, a difficult feat in the thin air that required a lot of breath-catching breaks. 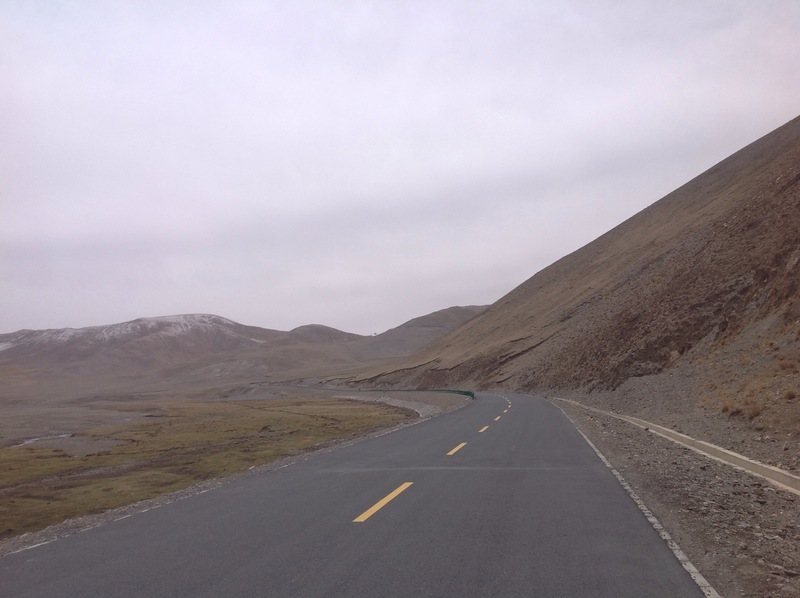 But it was worth the effort, we were up on the new road with fresh Tarmac all to ourselves. As it turned out we needn’t have bothered exerting ourselves like that as not long after we got onto the road the old road merged with the new. From here we climbed out of the valley and up into a wide expanse of plains. A town lay on a river nestled up against the foothills of some mountains, we could have lunch there. The town was another one of these newly renovated towns. We had lunch in a small noodle place next to a mani wall opposite a basketball court. The kids playing basketball found our presence much more amusing than their game and ogled us from the windows of the noodle place. They were a happy and excitable lot and accompanied us as we went to look at the mani wall after lunch, shouting out the Buhddist mantra ‘om mani padme hum’ as we walked around the wall to peals of laughter from their comrades. It would be the equivalent, I suppose, of a group of Chinese tourists out in some small village in Ireland looking at the local church while the local youths followed them shouting ‘our father who art in heaven’. 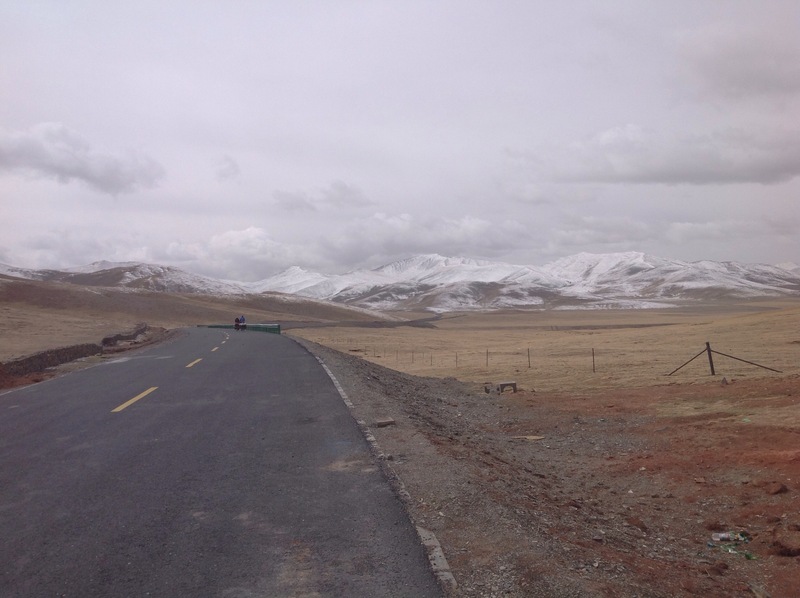 As we were leaving town a car driven by a monk pulled up and a young Tibetan guy in skinny jeans got out and started speaking to us in perfect, unaccented English. This was Tashi. He invited us to stay with him in his place tonight, ‘just for kindness’. Not to turn down such kindness we agreed. He had to go teach for a coupe of hours, so we had some time to kill. There’s only so much unfiltered attention from locals a person can take at a time, so we rode out of town and hid under a bridge on the dried up river bed and watched a movie on Finns laptop. We went back to town and met Tashi at the appointed time, 7 o’clock. 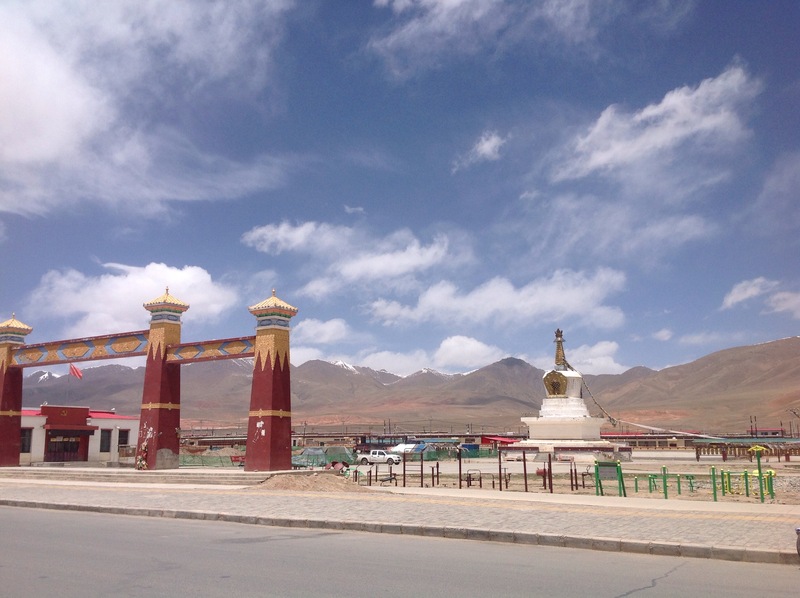 He took us back to his place where we spoke to his uncle and aunt and said hello to his old grandmother who sat spinning her handheld prayer wheel. Tashi’s parent s were away as it was a holiday period in the region. Tashi explained that now was the time the locals went out into the hills to pick the catapult fungus, a rare fungus with medical properties that would be the sold on to China proper. 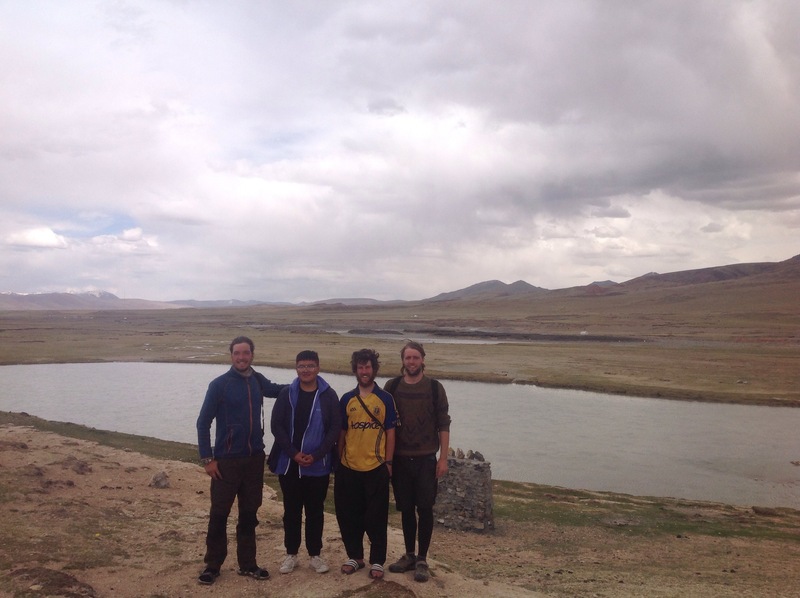 We didn’t really understand exactly what he meant by ‘harvesting’, ‘medicinal properties’ or even ‘catapilar fungus’ but this is Tibet, there are some things we can’t fully understand. Tashi showed us the spare room where we got to sleep indoors in a bed. 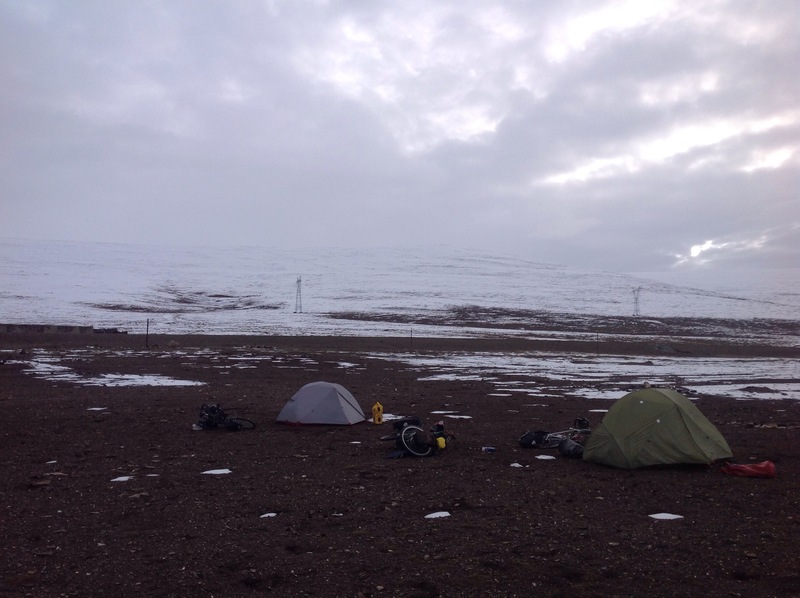 One of our coldest mornings out on the plateau this morning, not least because we had decided to camp so high up. A biting wind was blowing down and being thrown around in many different directions, funnelled by the multitude of valleys and bouncing off the mountain faces. It was overcast and a light snow had fallen yesterday, hard to believe it’s almost June but it makes sense now why the plateau is referred to by some as the third pole. 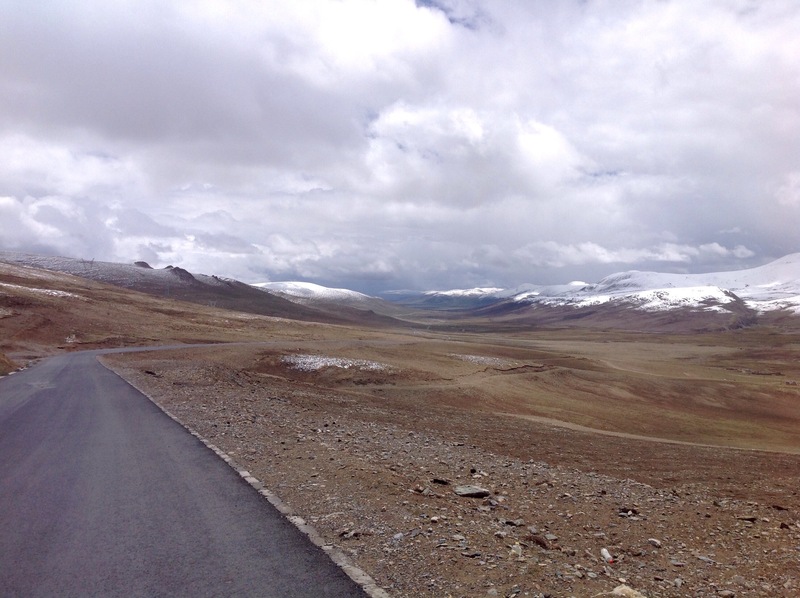 We pedalled up and down many hills through quiet, empty landscape punctuated by prayer flags and yaks. We climbed a short pass and then down into the neighbouring valley where we began to climb a bigger pass with long switch-backs that would stretch for almost a kilometre before turning. Up here above 4000m the internal combustion engine powering the heavy trucks and machinery don’t work effectively, on account of the oxygen deprived air. As a result the road can’t be too steep or else a heavily laden truck won’t be able to get over it. We got up the pass eventually, it’s the highest pass of this leg so that was a nice relief. From the top we could see a pretty big town down in the distance, and where there is a big town there’s the promise of a hot lunch. 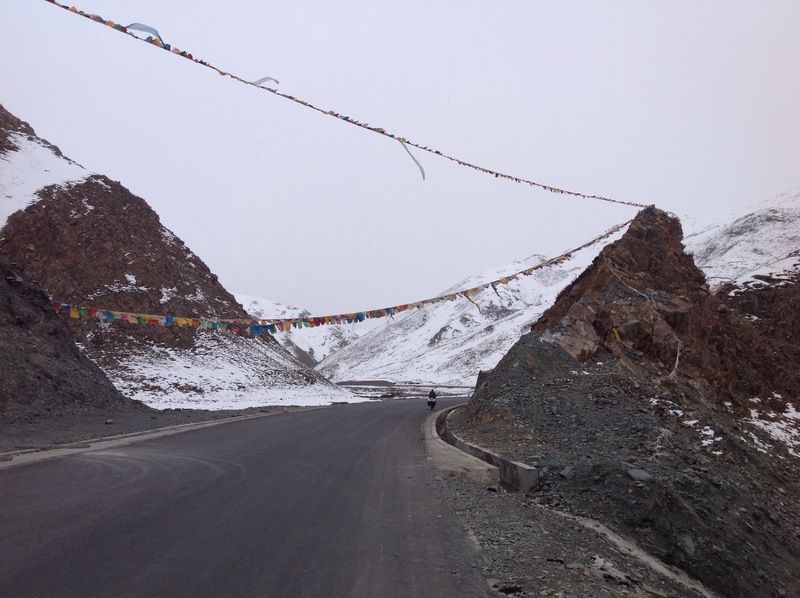 We took in the view from the pass for a while, waving at the Tibetans who would pass by on their motorcycles or watching the colourful paper flutter in the wind, thrown out of a car as it reaches the highest point on the road. We flew down the other side, propelled not only by gravity but also by the strong, stiff wind which seems to have finally decided which direction it wants to blow. 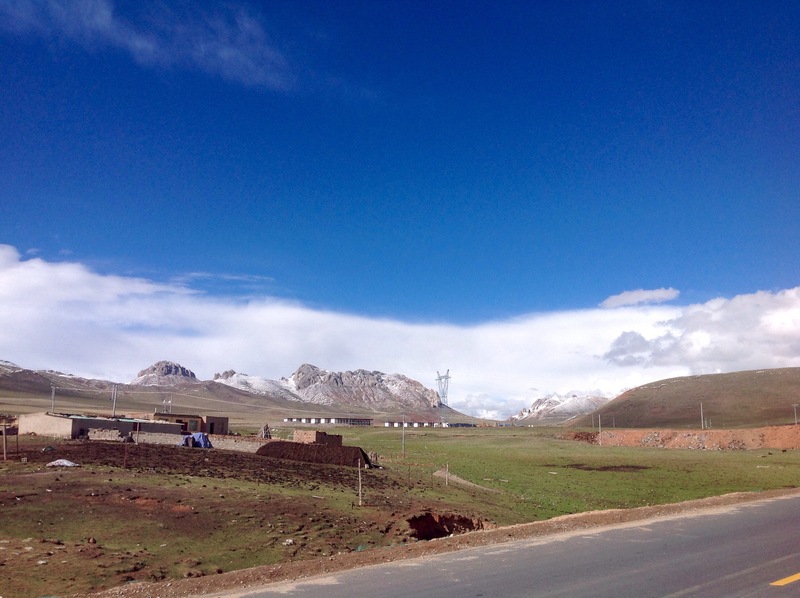 The town of Qumalai was in the middle of receiving what we had started calling ‘the Han treatment’. 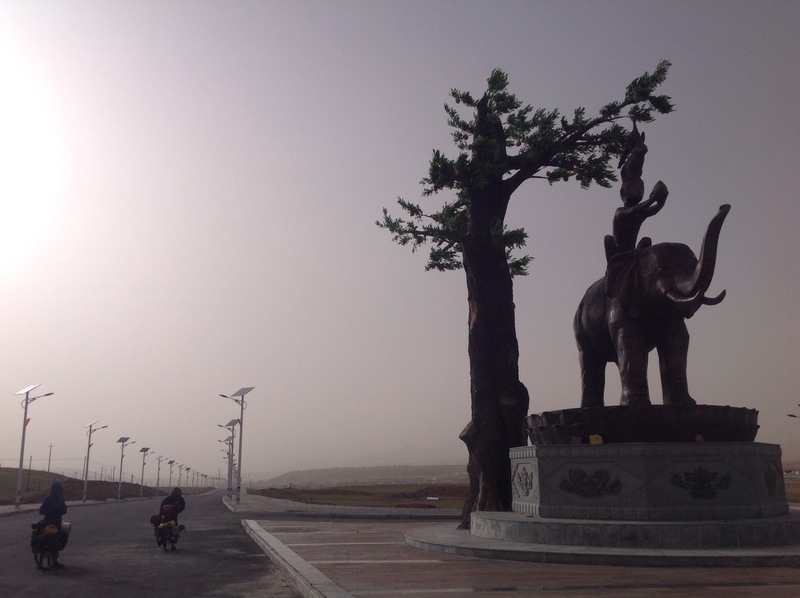 If the desert towns we had passed through in Xianjiang were the finished product, Qumalai was midway through its transformation. We road in on a wide new boulevard, freshly laid, lined with workers building the footpath. To our left, stretches of identical government housing, to the right building sights with the soon to be towering monoliths of government building in various states of completion. We passed by a huge new hospital, from the outside bright and gleaming though if it was up and running yet I don’t know. Eventually we got into the old Main Street of Qumalai, where shops and restaurants and hotels were up and running. The road was in the process of being resurfaced and with all the building going on around town and the strong wind blowing through a haze of dust had been kicked up. We had lunch in a Han run establishments, a delicious meal of red fried beef and potato. Leaving Qumalai we had our backs to the strong wind. Out of town the new road wasn’t open yet so we followed the old road through a narrow valley beside a meandering stream in lush green grass. This valley then met the wide river valley that the stream fed into. The scenery here was dramatically different from what we had been through the previous days. Everything was much more green than before and landscape had left behind the open plains and low rolling hills for the steep spurs of the river valley. 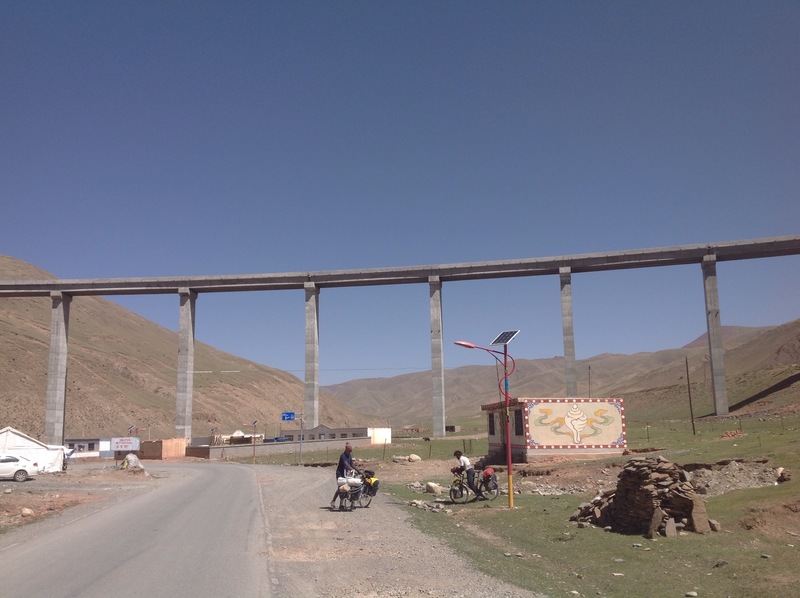 The Chinese obsession with construction and improvement here was startlingly evident when we saw the bridge that had been built for the new road to span this valley. It was huge and looked completely out of place, as if some aliens had come down and placed this concrete behemoth in this pastoral scene. Which in some ways is exactly what happened. The old road followed the banks of the river. We kept cycling until we came across a big concrete sign slightly apart from the road which could act as a wind break and provide us with some shelter.